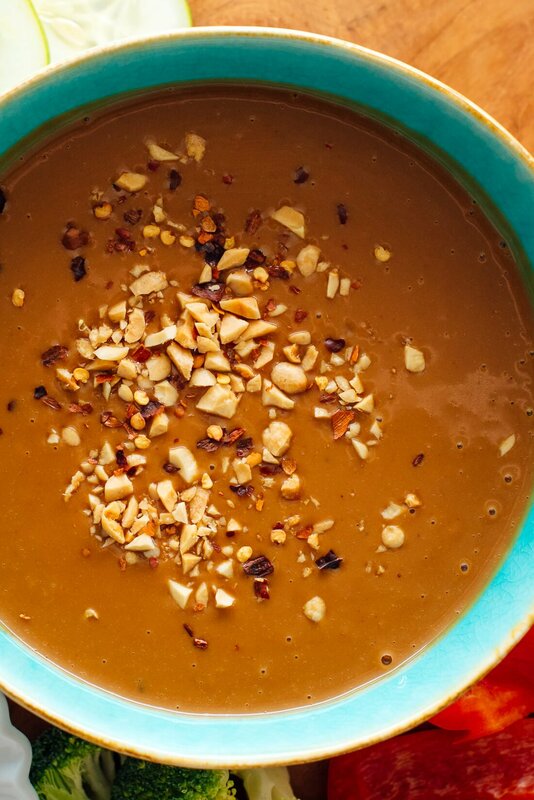 Since we’re entering the season of potlucks and barbecues, it’s time to share my go-to peanut sauce recipe. It’s creamy, savory, a little spicy and totally satisfying. Bonus? This flavorful sauce is easy to make. Make some and you’ll want to drizzle it on everything! This peanut sauce also makes a stellar veggie dip. Store-bought veggie dips are notoriously full of preservatives, but not this one. Veggie dip aside, this peanut sauce is wonderful over noodles and served with spring rolls. You can also drizzle it on steamed or roasted vegetables for some extra protein and tons of flavor. It’s great with mango, too! I like this sauce the way it’s written below, but feel free to play around with it. If you want a more traditional Thai peanut sauce, you can substitute coconut milk for the water. This will mellow the other flavors a bit. If you want an extra burst of fresh flavor, add a squeeze of lime juice and/or some chopped cilantro. If it’s too thick for your purposes, simply thin it out with some additional water or coconut milk or lime juice. Please let me know how you like this recipe in the comments! I always love to hear from you. 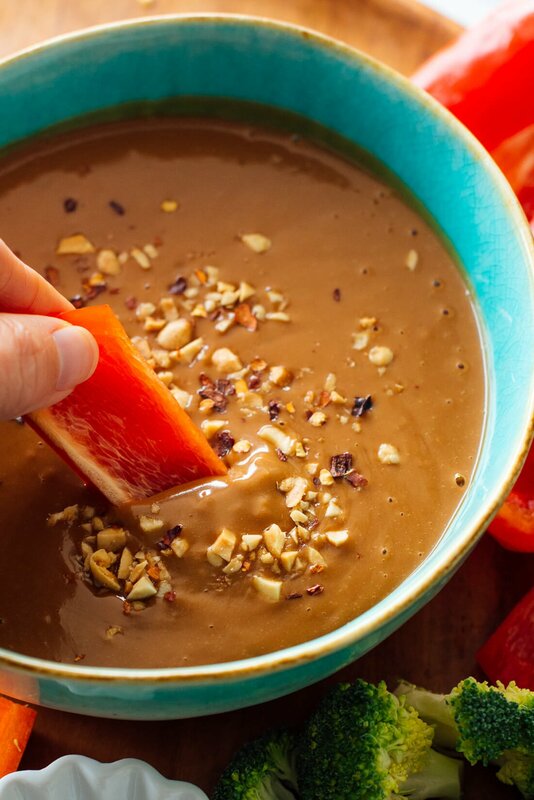 You can serve this healthy peanut sauce recipe as a dip or drizzle over Asian dishes! You can toss this savory peanut sauce with noodles, too. It’s good every which way! Recipe yields about 1 ⅔ cup sauce. In a 2-cup liquid measuring cup or medium-sized mixing bowl, whisk together the ingredients until well blended. If your peanut butter is particularly thick, you may need to use the full 4 tablespoons of water to thin out the mixture (or more, if necessary). Feel free to adjust to taste here—for example, sometimes I want my sauce more savory and add another clove of garlic, or a little sweeter, so I add extra honey. If you’re serving the sauce as a party dip, transfer it to a serving bowl and sprinkle with chopped peanuts and red pepper flakes for some visual interest! Recipe adapted from my broccoli rabe peanut soba noodles and peanut-sesame slaw. Make it vegan: Use maple syrup instead of honey. Make it gluten free: Be sure to use gluten-free tamari, not regular soy sauce. Storage suggestions: Store this dip in the refrigerator, covered, for up to a week. You may need to whisk it again before serving or wake up the flavors with a little splash of vinegar. Food on the brain is always a good thing! This looks so good. 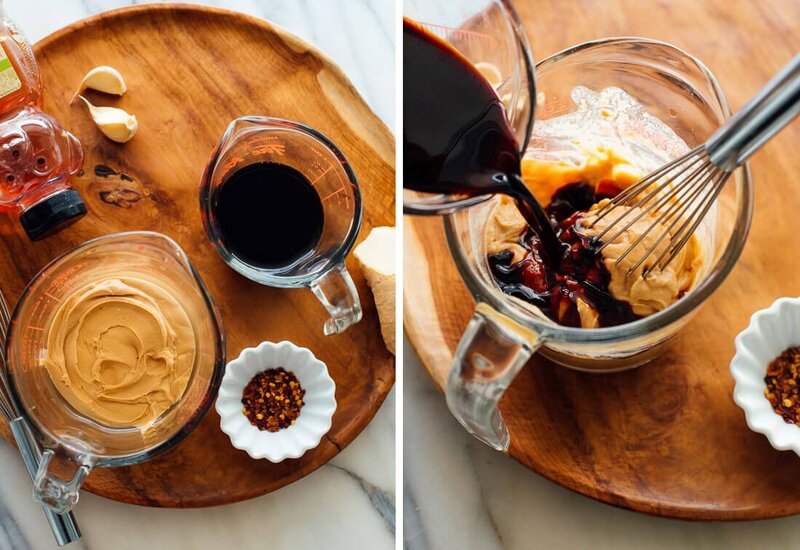 I never just eat plain peanut sauce, but now I am going to change that!! Made the sauce exactly as written. Turned out wonderful. Made veggie spring rolls to dip. Soooo good. It’s a keeper. Thanks for sharing. I made a version of your peanut sauce for noodles once – so delicious! I absolutely love anything sweet/salty and this dip looks like it’s right up my alley. Can’t wait to try it! That dish sounds amazing! Thanks, Ingrid! This dip looks divine! I love the idea of drizzling it on grilled fruit – I am positively obsessed with grilled fruit this summer! Thanks, Jessie! I bet it would be phenomenal on grilled pineapple! This sounds so good, I just bought powder peanut butter, do you think I could try this with it. And would value your opinion on the product. Hi Dolores! I haven’t used peanut butter powder myself, but from what I understand, it seems like a fine product. I don’t think it would work great in this recipe, though, because the peanut butter’s creamy texture is essential to the end result. You might like smoothies with peanut butter powder in them. I just got some peanut flour, which is very similar, so I need to start experimenting with it! Peanut sauce is literally my life! I couldn’t live without it! 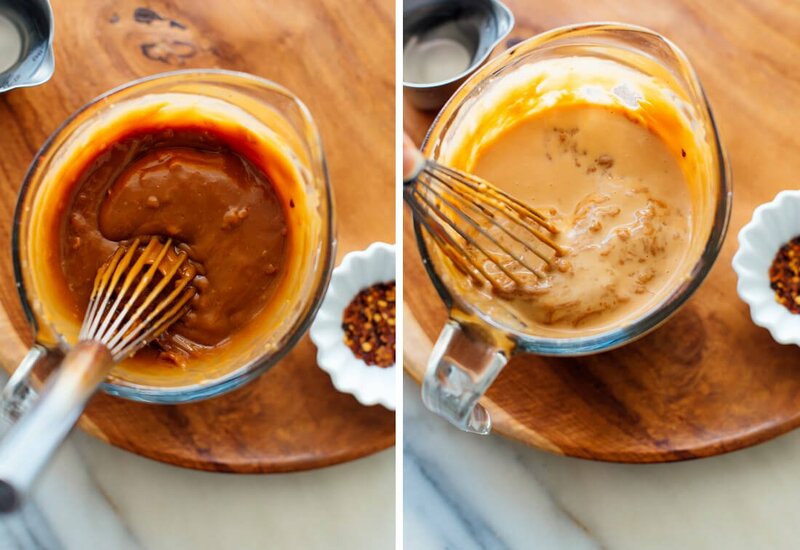 I’m all about a great peanut sauce; I know I’d drizzle this over almost everything! My food budget is gone until July 1. But I always have peanut butter on hand (hello, 2 boys under 5?!). So we will be having this with noodles and sweet potatoes and calling it dinner. Thank you!! If you have spinach in the freezer, you can add that, too. Radishes, turnips, carrots tend to be available for a couple of dollars a bunch and can be grated into the noodles in a bit of a hidden way. (If you can get the bunches with greens, then you get two foods for the price of one!) If the flavors are too bold for your little guys, cook them a little bit first (radishes lose their kick when you saute or steam them). I work with low-income populations, so just guessing from your post. Did you know that most farmers’ markets now take EBT cards, and the majority of them will double the first $10–so you go to the manager’s booth, they take $10 off your EBT card and give you $20 in vouchers to spend at the market. Peanut dipping sauce sounds delicious. I love peanut butter in savoury recipes. this looks amazing. I always take a chopped salad into work for my lunch, usually with crudités and some sort of dip. This sounds like one of those perfect recipes that I can whip up on a Sunday night and then use throughout the week. Anything that is time-saving, always goes down well. This looks and sounds amazing! I’m definitely going to give it a try these days. Thanks a lot, Kate! 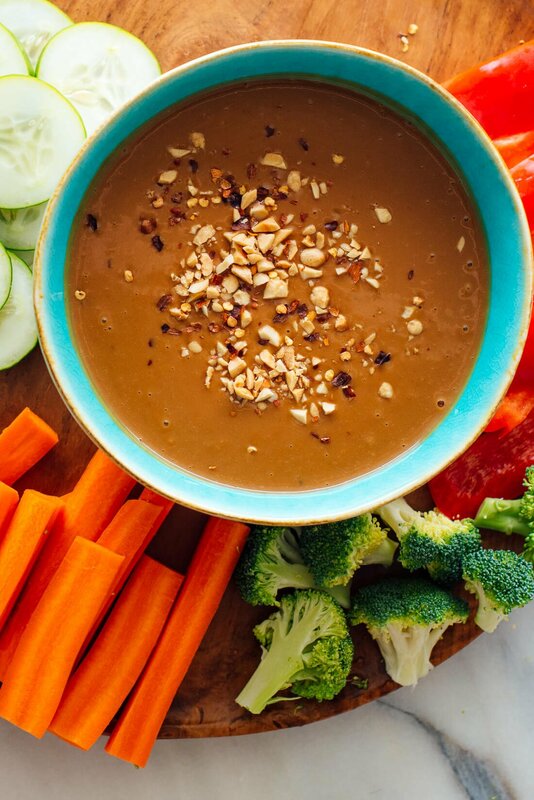 This peanut dipping sauce is so amazing! Yummy! This sauce…..just this SAUCE! I am dying to dive in headfirst! Amazing!! I love satay sauce so this would be my idea of heaven. I want some now!! I made almost exactly this sauce for leftover steamed veggies last week! I’m glad to see your post, as I struggled a little bit with the proportions and now will use yours for guidance. My favorite sweetener: Habanero Maple Syrup from the farmers’ market! Thank you, Stephanie! That spicy maple syrup sounds amazing! I have a family member who can eat NO salt or sugar. Can’t even used reduced. NO SALT whatsoever. What could I substitute for tamari sauce? Do you think it would be good without it? Hi Deb, that is an interesting question. Is honey allowed? I think this dip would definitely be lacking complexity without the honey and tamari. I have heard of using coconut aminos in place of soy sauce, but I checked and those contain salt, too. If you can use honey and maybe a splash of lime juice or coconut milk in place of the soy sauce, I bet that would be good! I use liquid aminos in place of soy sauce when I want very little salt. Bragg’s liquid aminos contains 6% sodium compared to soy sauce’s 38%, and it tastes different than soy sauce, even more amazing I think. I have the same problem and just saute finely chopped onions and add them instead of honey or sugar. Sodium, can’t help with tho, sorry. I have made this recipe many times and absolutely love it. Tonight I had it on noodles with sautéed red bell,yellow bell pepper,spinach and chicken.It was delicious! Yes to peanut sauce! I usually eat mine with fresh summer rooms, but now I’m wondering why I don’t just make big platters of peanut sauce with simple chopped veg and go to town. Clearly the best plan! Peanut sauce as a veggie dipping sauce. Awesome idea! Adding veggies to my grocery list now. We do not keep peanut products in the house due a family member with a severe peanut allergy – Can I easily substitute almond butter? I have been searching for a dipping sauce recipe to duplicate that at my local Vietnamese restaurant, which has me licking the container! Hi Becca! Yes, almond butter should work well! I feel like there is no occasion that peanut sauce doesn’t make infinitely better! I tried this as a dip for steamed green beans and I was not a fan of it at all. I felt that the peanut flavor was really subdued after the soy & rice vinegar. I am going to try a variation without the vinegar. The photos are lovely though! This was brill. I’m definitely going to make it tons. Even though this is a dipping sauce, I made this last night with some crispy baked tofu, whole wheat noodles, and sauteed cabbage, peppers, and yellow squash. I could not believe how good it all came together! I still have leftover sauce for one more serving, and I’m already looking forward to it for dinner! I made this tonight using powdered ginger (I was out of fresh), and thinned it out a bit to serve as a sauce for noodle bowls. I left out the red pepper so I could serve it to my toddlers–grownups added heat at the table. It was delicious–everyone gobbled it up! The perfect amount of sweetness (the last recipe I tried was like candy, even cutting out some of the sugar it called for). Thank you for the recipe–I will definitely be making this again. Already made this twice this week. It’s the best peanut sauce in existence! I didn’t have “reduced sodium soy sauce” – but I had some Braggs Liquid Aminos, which is similar to soy sauce. It has 320 mg of sodium in 1 tsp (or 960 mg in 1 T), compared with regular soy sauce, which has 1320 mg sodium in 1 T. It seemed like a lot of salt to add 1/3 cup, so I added 1/4 c, which still adds up to 3840 mg of sodium! Course, I’m not going to eat the whole thing at one sitting! But I have gotten away from eating salt and sugar, and for me, the salt was just overwhelming. I’m going to have to “thin out” the recipe by doubling the other ingredients – which is way more dipping sauce than I need, but maybe I can freeze it? Was curious about how many mg of sodium are in 1/3 cup of the low sodium soy sauce. Hi, this is the first recipe that I have tried from this blog, and I absolutely loved it. I loved that all the ingredients were pretty common household items. The taste was amazing, it tasted delightful over tofu fried rice. Thank you so much for this awesome recipe, you are great. I love the peanut sauce thank youfor this lovely recipe. Thank you for letting me know, Delmis! Glad to hear it. I used this to make a peanut dish with udon and zucchini noodles and Thai meatballs! Very yummy!! I was hesitant to try making my own peanut sauce but this was easy and soo good!! Will be making this with steamed veggies instead of ordering takeout! Thank you, Sara! Happy to hear it! I’m happy to hear it, Uma! This was amazing, plain and simple. My partner and I are struggling financially at the moment and I needed something I could make for lunches for the week. I was searching for a nice satay recipe; however, everything I found called for coconut milk (which I didn’t have on hand). I eventually stumbled across your page and I luckily had every ingredient called for. I chucked it all in the slow cooker with some chicken from the freezer and frozen veggies from the bag and let it cook on low for about five hours. It was SERIOUSLY good. I would say the best satay I have ever tasted. It was rich but not heavy and it tastes even better today. First, I’m sorry to hear you are struggling, Bret. I hope this tough time passes soon, and you & your partner give each other comfort. I’m *so* glad that this recipe was easy and delicious for you! Sending you all the best. SO GOOD. Thanks!! I made it as directed, but there’s definitely room to make variations. 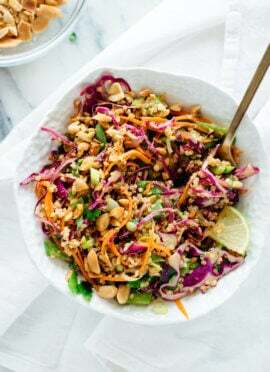 I made it in my food processor & threw in a handful of unsalted roasted peanuts, which gave it a great chunky texture (which I realize not everyone likes) Anyhow, I’m planning to thin some of the leftover and use as a “dressing” on an Asian inspired salad. I will be making this ALL THE TIME. Delicious! I’m so glad you found so many uses for this sauce, CC! Thanks. OMG Sooooo gooood!! Thank you!! Fantastic recipe, and easy to make. I was looking for a peanut sauce and stumbled on your recipe. I had crunchy peanut butter on hand, it merely gave it more texture. Thank you! I made this yesterday for my Thai spring rolls, it was delicious but little salty although I used Low-sodium soy sauce. I added little coconut milk and it was perfect! Thanks! This is EXACTLY what I was looking for! ( left red pepper flakes out otherwise followed recipe exactly) Just like what my favorite Thai place has! So excited, I will use this all the time with tofu, veggies, rice noodles etc. I have tried so many times and this is it! Thanks! Forgot to add my soy sauce is the low sodium…..peanut butter is Adams creamy. Looks great – can you freeze this sauce in an icecube container??? I don’t see why not, Michelle! I know freezing it works, so it should be fine in smaller portions. goin to make this today. one question. just regular peanut butter or I have some that is organic which has no artificial sweetner? Yes, I think the organic one would most likely work better, Joe! This dip is delicious! I used it as a dipping sauce for salad rolls. I added Siracha for a little heat. I used white vinegar instead of rice vinegar, coconut aminos instead of soy sauce, and omitted the red pepper flakes and this was STILL a 5-star recipe. Is it weird to just eat it with a spoon? Don’t answer that. We had this on collard green veggie wraps. I think it could transform any raw veggie dish and make it a hundred million times better. THANK YOU, Kate! I’m glad this came out great with what you had on hand, Jessica! I love how versatile this is, too (I won’t tell anyone about the spoon-licking). 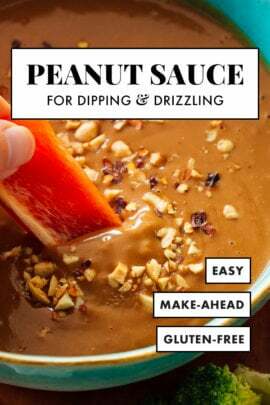 I am very excited to make this, this is my first attempt to making any peanut sauce. I would like to sub water for coconut milk because that just sounds so good but were you suggesting coconut milk from the can? I hope to hear from you soon, i need to make this now! lol Thanks again! Hi, Crystal! Sorry this is late. I usually use coconut milk from the can, yes. Wowzers!! This was so great and very tasty. Best peanut sauce I’ve ever had by far! Haha! Thanks so much, Sigrid. I recently had a dish at a trendy restaurant in Cleveland that I couldn’t wait to reproduce at home. Your peanut sauce created a dish as amazing as the one I had there. Lightly cooked a few vegetables, shredded a rotisserie chicken, stirred in your peanut sauce and served over jasmine rice. Served with crushed peanuts, extra red pepper flakes, lime slices, and chives. Even the picky “I hate peanut sauce” people had seconds. Oh, I’m so glad this worked out, Amanda! Enjoyed! Put it on baked tofu, rice, and broccoli. Did not have honey so instead i used a tablespoon and half of that honey ginger tea crystal stuff. Worked far better than I feared. Cheers! Great! I’m so glad it worked out so well, Gabriele. I just found your site and after trying several recipes I bought your book also. I always think it funny that people will say what a good recipe something is and then proceed to explain all the modifications they have made to it. Well, me too, apparently! I changed the rice vinegar to lime juice to sharpen the taste, reduced the honey and ginger and garlic somewhat, used whole peanuts, and then blended the whole thing in the food processor. The basic ingredients were mostly there, so I too can declare that the recipe is good! Haha! I always encourage people to experiment in the kitchen and tweak recipes to what’s available to them and what tastes good. Your version sounds delicious! I made this sauce recently and even though I did not have ALL of the ingredients it was still delicious. Making it again today. We are not vegetarians here but I love your recipes nonetheless. Delish always!!!!! Peanut Sauce was amazing! I doubled the ground ginger and added a squeeze of half a lime for zest! Delicious! Thanks for a great recipe! I made this recipe with Spring Rolls today. My husband and I loved it, and it was also a hit with the teens, tweens, and toddlers. Thank you. Yum! I love the spring rolls with this sauce. Happy everyone loved it! This sauce is devine! It was simple to make and hard not to eat it all at once! I made it to go with your baked tofu and it was delicious. 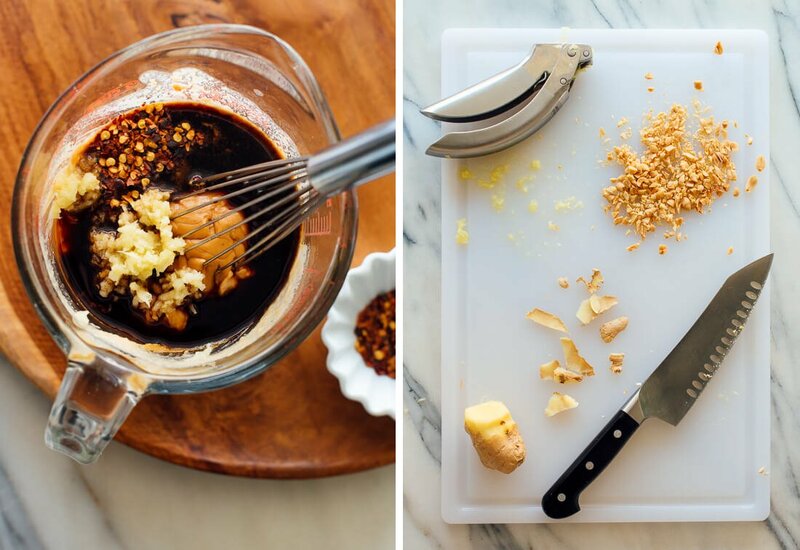 I’ve made this delicious peanut dipping sauce at least a dozen times. Whipping up a batch today for my Christmas eve veggie platter. I follow the recipe almost exactly– a tad less garlic and a little more ginger. Excellent! Thank you, Kate. I love red pepper! Adding more sounds like a great way to add more kick. Thanks for sharing, Benita. This was my very first time making peanut sauce and let me just say this recipe was so delish. I subbed a few things. BecauE I didn’t have rice vinegar, I used balsamic vinegar (kept measurements the same), and I used unsalted peanut butter instead of regular peanut butter, 4 tablespoons of honey instead of 3 and I cane out absolutely perfect. Will def be trying again in the near future. Thank you so much for this quick 10 min recipe. Welcome! Thanks for sharing, Sharon. If you would want to leave a star review since you liked it so much, I would appreciate it. This was my very first time making peanut sauce and let me just say this recipe was absolutely delish. I subbed a few things. Because I didn’t have rice vinegar, I used balsamic vinegar (kept measurements the same), and I used unsalted peanut butter instead of regular peanut butter, 4 tablespoons of honey instead of 3 and it came out absolutely perfect. Will def be trying again in the near future. Thank you so much for this quick 10 min recipe. You’re welcome! Thank you for trying it even with the substitutions. I’m happy it worked well for you. SO good. Exactly what I’ve been searching for! Awesome sauce! Put it with roasted spaghetti squash, topped with a bit of basil and green onion. Was delicious. Hi Melissa, I’m sorry to hear that! Was your peanut butter really thin to begin with? I just adjusted the recipe to offer a range for the water amount. I’m sorry this one didn’t work out for you like it did for me! I made a double batch of this last week when I had my extended family over, and it got rave reviews! I kept it warm in a small crockpot and let everyone ladle it over roasted veggies, quinoa, and rice. It’s a great vegan protein option for Asian-inspired food! That’s a great way to do it, Lisa! I love that. Thanks so much for your review. I added toasted sesame oil instead of water and it worked fantastically. Drizzled over quinoa and grilled chicken and carrot slivers. This was delicious. Salty and tangy and savory. I enjoyed it on my meats and veggies. Love that description, Jen! I appreciate the review. Beautiful sauce. I used crunchy peanut butter, lemon instead of vinegar. Jaggery instead of honey. Dipped some crunchy lightly steamed vegetables, with some brown rice! Delicious. Thank you, for sharing! I appreciate the review. Very good, needs a day in the fridge to meld the flavors. I used it as a veggie dip, so added 2T mayo for extra creaminess. Caught a guest scraping the remainder out of the dish with a spoon and eating it! Ha, that’s awesome! Thank you, Victoria for sharing. I appreciate the review. Can you substitute apple cider vinegar for the rice vinegar? Thank you, I love this recipe! I use it a lot with my stir frys! It’s so good! I love that this is a go-to sauce for you, Julia. I’m not sure how anyone who made this recipe is still healthy! I think there’s a major typo. It calls for 1/3 cup of low sodium soy sauce or tamari. That’s insane! I wish I would’ve caught it ealier, as I tripled the recipe so it was costly. Most recipes call for 2-3 tablespoons at most. It’s so salty. It had to be thrown away. Hi, I’m sorry you didn’t enjoy this recipe. The soy sauce amount is correct, although you’re welcome to try it with less next time. 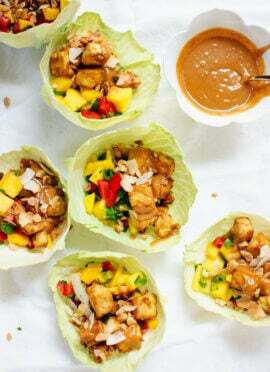 I just tried this recipe with the peanut sauce alternative, and it is so so amazing! As a college student this is a pretty simple recipe so I appreciate that, thank you! 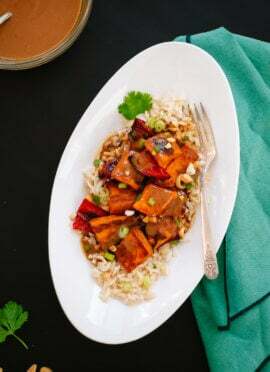 Thank you so much for this peanut sauce recipe!! I had a bunch of zoodles that I wasn’t sure what to do with so I drizzled this over them and it was soooo amazing!! You’re welcome! That sounds like a great way to use it, Hannah. Incredible!! My entire family loved it. Dad wins big tonight! Great! Thanks for your review, Chris. Made this today, and even my 1 year old loves dipping his chicken in it! Will definitely make again (next time I’ll try the coconut milk instead of water). I love that! Thanks for sharing, Alysha! Great recipe. I added more vinegar and soy sauce to taste. My family really enjoyes it and devoured their vegetables. Thanks! Thank you for sharing, Addie! This sauce is soooo delicious! Definitely my new go-to peanut sauce. Also, I’ve been trying out your recipes for the past month, and really like all of them. You’ve done such a good job here. Thanks for your passion and hard work!